Try our easy pork chop recipe. 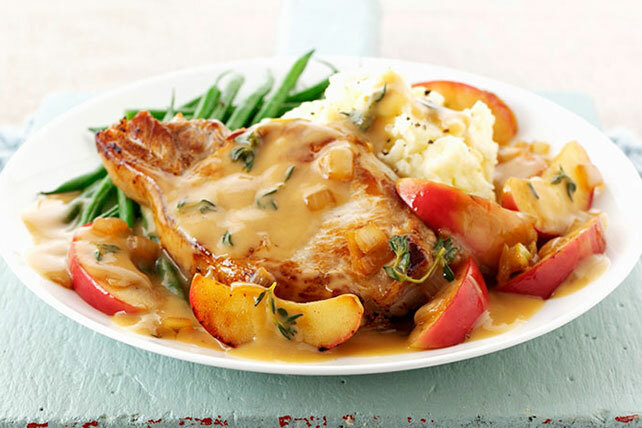 Sautéed apples and onions combine with pork in this pork chop skillet recipe that is sure to become a family fave. Heat 1 Tbsp. oil in large skillet on medium-high heat. Add chops; cook 3 to 4 min. on each side or until done (160ºF). Transfer chops to plate, reserving drippings in skillet; cover chops to keep warm. Add remaining oil, apples, onions and dressing; cook and stir 1 min. Cover; cook 4 min., stirring occasionally. Stir in cider, cream and thyme, bring to boil. Reduce heat to medium and cook 2 min. Return chops to skillet. Combine corn starch and water; add to sauce and cook 1 min. or until sauce is thickened. Serve chops topped with sauce. Substitute white wine, beer or chicken broth for the apple cider. There are lots of delicious apples, but not all are ideal for cooking. Try preparing this delicious recipe using any other firm red apple that will hold its shape when cooked, such as Fuji or Cortland apples.